I finished the blocks and pieced the top for the Central Park quilt that I posted about on Wednesday! I really love the bright summery colors of this quilt and hope that my friend whose baby I am making this for likes them too. I don't really feel that this picture does it justice, I will be sure to get a great picture of the finished quilt. Since I wasn't strict in making sure all my blocks were turning out the same size at first I had a few that were too small or too big that I ended up reworking a bit. It was kind of annoying but I liked working in the semi-improvisational style with which I made these so I don't regret it even if I had to go back and fix a few things. I love the zoo fabric in this line and think it will make the perfect backing for this baby quilt; I haven't decided what to use for binding yet but will probably use a solid purple or blue. 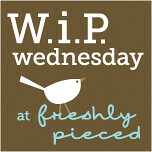 Also you can see my piecing above... I like to press seams open even though I think it is a little more time intensive. If you quilt, do you press seams open or to the side? Also, speaking of projects with Central Park fabric, here are two pincushions I made with this fabric too. As it turns out, I am getting more use out of my 5 quart bag of crushed walnut shells than I expected... although I still have LOTS left. The orange one was a gift for a friend, and after I finished this quilt top I decided to make one for myself too. I didn't really intend for them to match but they totally do. I even made the backs with the same design fabric - one of my favorites (of many favorites) in this line. I have been chomping at the bit to get started on this baby quilt using Kate Spain's Central Park fabric (one of my favorite fabrics right now), but I was waiting to get the last few fabrics that I needed. When I first picked up this fabric, I bought much more of the orange/yellow/green colorways but couldn't resist getting a few of the gorgeous purple prints too. Well, I decided I wanted to make a purple/aqua/green quilt before the orange/yellow/green one, so I looked around to try to find some yardage of a few of the aqua prints I wanted. For some reason I was having a hard time finding them, so I decided to get a charm pack instead. I'm actually really glad that is the way it worked out since it means I get to have a much greater selection of the prints to work with in my quilt! 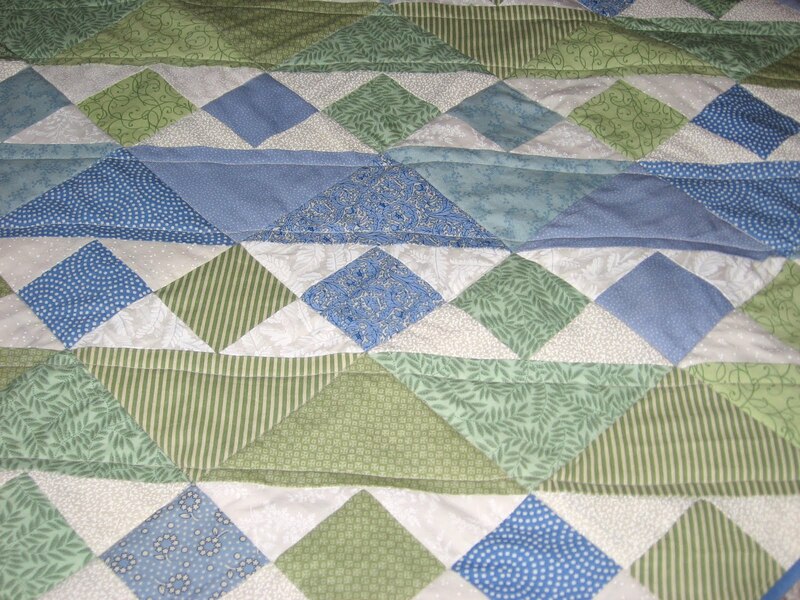 I decided to use mostly green prints from my stash (including a print from a previous Kate Spain line, Verna), because I thought a slightly less yellowy green went better with this blue and purple quilt. 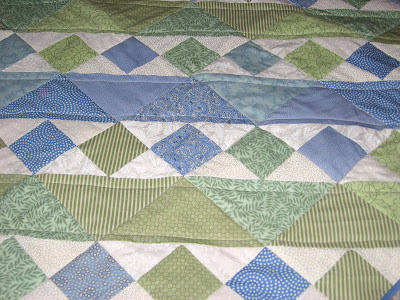 Plus, the Central Park green prints will be great for the orangey quilt so I am saving them for that. I starting putting together blocks yesterday and here is what I have so far... I am making them up as I go and want to have a variety of center block sizes and widths of borders. The blocks are going to be 9" square (before joining) although a few are larger now, but I am going to trim them all before I assemble the quilt. A few of these blocks I am not totally in love with so I will see how things fit together as I make more blocks - some of these may not end up in the final quilt. Overall I am really happy with the color scheme and design so far though! I have been sewing a number of projects for gifts but I snuck in some time over the weekend to sew up this gardening apron/tool belt for myself. I seem to always be sticking things in my back pockets when I am gardening - from garden tools to seed packets to my phone and keys - so it seemed like a good idea for me to have someplace to hold everything while working in the garden. I have to admit, though, that the idea was more than a little inspired by the fabric (Suburbia by Caleb Gray) and wanting to have a project to use it for. The basic design is pretty simple - the pocket has the quilting cotton on the outside and canvas on the inside, and the body of the apron is also made of canvas. The pocket is attached to the body with bias tape, and then the main canvas piece is folded down to create a waistband (and a spot to attach the ties). I added some non-essential details to the basic design, including making the ties out of two layered fabrics, and putting a bit of decorative trim in at the waistband (just a folded piece of fabric). I am really happy with how it turned out! UPDATE: Since it sounds like a number of folks may want to make something similar, here are the dimensions of mine in case it is helpful: it's 25" wide and 10.5" tall, the pockets are 7" tall and I sewed the divisions between the pockets at the midpoint (12.5") and then 4.5" from the midpoint on either side (eg at 8" and 17") - this creates two narrower pockets and two wider pockets. But really I just eyeballed it and thought about what would be helpful to me, so you can of course do whatever you think makes sense! Having a fun new apron/tool belt made me excited to dive into the task of weeding our (small but weedy) front garden - here's the pile of weeds from my gardening session today. I found that I actually liked to wear the apron in back so that it didn't get bunched up while I was kneeling/bending over. It worked great to hold all my stuff and is now well broken in and dirty! Have you made any fun projects for yourself lately? Have you seen the great sewing vs. knitting roundups and tutorials that Shannon from luvinthemommyhood has been sharing on her new blog, Versus? I loved this idea when she did it last fall/winter so I was psyched to see that she was doing it again... and I am super excited to be guest-posting over there today with a tutorial for mosaic knitted pouches! If you are looking for a fun colorwork knitting project, head on over and check it out. The link on Versus seems to not work so here is a link to the pattern if you are looking for it. And if you are visiting here from Versus, welcome! 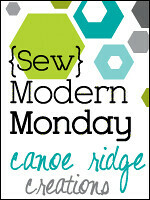 I hope you have fun checking out my blog - you can see my free sewing, knitting and craft tutorials, and patterns for sale here, and you can find an index of recipes here. I am super excited to have joined the Love circle of the do. Good stitches charity quilting bee! I had been thinking about joining a quilting bee because it seems like a great way to meet other quilters and to try out new techniques and color schemes that I might not otherwise try... but I was not sure I wanted to join a full-on bee where I would have responsibility for designing and quilting one month. So I am thrilled to have joined this bee as a stitcher, where I get to sew fun new blocks each month and don't have to worry about being the designer/quilter at any point (at least not yet, maybe later I will be ready to be a quilter in this bee!). I also love that the quilts are all made for charity, and are given to kids in need of a special quilt. Plus, the quilts that the different circles in this bee have been making are just gorgeous - check out the Flickr pool if you are looking for some inspiration! I was also excited to see that Natalie from Greenleaf Goods was the quilter designing the blocks for my first month with the bee! I have enjoyed reading Natalie's blog and getting to know her a bit online, so it was wonderful to be starting with someone who is already a friend. She has a great sense of color and design so I wasn't surprised that the block design and colors she picked were just beautiful. Someone in the group described them as sherbet colors with all the greens, yellows, oranges and pinks and I agree. I had fun sorting through my scraps and fabrics in my stash to find ones that fit the bill. I can't wait to see how the whole quilt looks together and what the blocks are for next month! Today I got out the Ukrainian eggs which make up the entirety of our Easter decorations and I thought I would share them here. I learned how to make Ukrainian eggs as a kid and have always loved doing it, although I haven't made them in a number of years. I love the rich, vibrant colors and intricate designs which you can get with this technique. Most of these eggs are based off traditional Ukrainian designs but I have also made ones that were more modern - polka dots, daisies, and words, among others - I think my mom has most of those still. I have an egg-blower tool so luckily I can safely store these and get them out year after year! It's fun to play with how to fit the design onto a 3-D shape and to figure out the dye sequence to get the desired colors. What are your favorite egg-decorating techniques? Have you ever tried making Ukrainian eggs? I think this is it for me this year but I'm hoping to either make more Ukrainian eggs next year, or try out another decorating technique. I have a number of things I am working on right now, but nothing that I can show you here yet, so I thought I would share a quilt that I made several years ago but never blogged about (excuse the pictures - these are all I took before I gave it away). There is actually quite a story behind this quilt. I started making blocks for this quilt right after I graduated college, and the plan was to make enough to make I think a full size quilt - this was going to be my first bed-sized quilt. I originally was actually hand-piecing all the blocks, if you can believe it! That was how I originally learned to quilt, and I was worried about being able to match the points if I sewed the blocks on the machine (although in retrospect I am sure it would have been fine). I had a whole variety of blue and green fabrics in a wide range of values, and I think I was trying to make 168 or maybe even 224 of the 5 1/2" squares (and then was planning on adding a border). I hand-pieced really a lot of blocks, I think 40 or 50, and then it dawned on me that this block pattern would be easy peasy to paper piece. So I made up a bunch of paper templates and went to town sewing them up on my machine. But somewhere along the way I decided that the quilt was really going to be more traditional than my liking and I just put it all aside. My friend loved the finished quilt and I put the rest of my paper templates, cut out fabric, and all the darker value blocks back in the drawer. I had really forgotten how many finished blocks I still had until I got them out today to take a few more photos for this post! I definitely have enough of these to make another baby or lap sized quilt, so I may yet put them to use. I had some fun laying them out in different designs, so come back tomorrow if you want to see those options. This quilt definitely was on the more traditional side for me but I think it is fun to think about how to adapt some more traditional block styles and arrangements to be more modern. 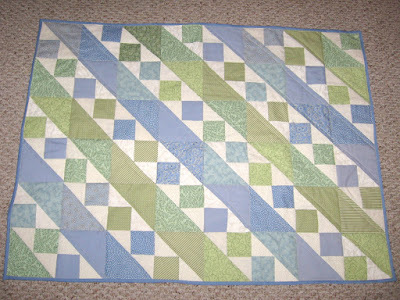 I think that part of what made this feel traditional was the small blocks; I bet a larger quilt with bigger blocks - like maybe 8" or 10" or larger - would feel much more modern. Not to mention the choice of fabrics would make a big difference. 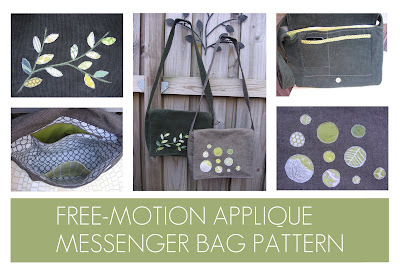 Free-Motion Applique Messenger Bag Pattern and Giveaway! I am so excited to be releasing my new PDF sewing pattern, for a free-motion applique messenger bag! 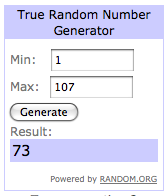 I decided to do another giveaway to celebrate - more on that at the end of this post. The pattern is for a medium-sized messenger bag with two design options for a free-motion applique decoration on the flap of the bag. The design includes a handy divided organizer pocket under the flap to store your phone, keys, and other essentials - or you can leave the pocket undivided if you prefer. The bag also includes two interior pockets, one open and one zippered, so there are lots of places to stash all your essentials! The pattern would also be great as a basic messenger bag pattern if you have your own decoration idea for the flap, or if you wanted to make it in a patterned fabric rather than a solid. Huge thanks to my pattern tester, Shelley, for all her suggestions to clarify and improve the pattern! I am really proud of the final product. The pattern is sold as a printable PDF file, and includes computer-drawn printable pattern pieces, cutting diagrams, and detailed step-by-step instructions/photo tutorial. The pattern is available for purchase from my Etsy shop [update: and in my Meylah shop with automatic download]. I'm also selling a few finished bags in my shop if you want to buy one already made up! To celebrate the release of this pattern I am having a giveaway! This giveaway will be open until next Wednesday, April 20, and is open to international folks (although I may ask you to pay any additional shipping for sending the materials if you win them, depending on how much it costs). I have enjoyed seeing all the mug rugs popping up on the internet - if you haven't heard about it yet, a mug rug is somewhere in between a large coaster and a quilted trivet - designed to hold a mug and a snack, or whatever else you want. They are also a great way to play around with different fabric combinations and quilt designs without the commitment of a larger project. Both to try things out and because they seemed like they would be handy to have around (especially for resting a pot of tea), I made some up with green and grey scraps. I started out by making a few zig zag designs - I sewed long strips together and then cut on the diagonal (with half angled one way and half angled the other way) and pieced together. I had been wanting to try this technique so it was fun to play around with. The one on the right is the first one I made and the one on the left was made with scraps from the first - which I staggered a bit to get a rectangle, but I actually really like the way that it looks! I quilted these to emphasize the zig zags and the borders and then bound them using Kerry of Very Kerry Berry's great single binding tutorial... but I sewed the back on via machine rather than hand. It turned out OK but certainly not perfect - I don't mind too much since I am keeping these and it's on the back, but I don't think I would do it this way for something I was giving away. I made another two mug rugs out of pieced strips, one with a kind of rail fence pattern and one with just slices of the strips surrounded by sashing (is there a name for this kind of block?). I like these two better actually because I think the border fabrics I chose for them work better. I did very simple quilting on the one on the right, and then practiced my free-motion quilting/stippling on the one on the left. I did the same kind of binding but this time took the time to hand-sew it down on the back and it does look much neater and nicer I think. They are a great size for a small teapot, like this porcelain teapot that I made last year (it has a celadon glaze - love how that glaze looks on porcelain). They also work great as mug rugs, with space for a mug and a snack. The colors of the mug rugs go really well with a lot of my homemade mugs. I hand-carved the patterns in both of these mugs, and I love how they feel a bit like a linoleum print. How about you - have you tried your hand at making mug rugs or other mini-quilts yet?